Pre-dinner drinks, late night card games - make the most of your private balcony. You'll want to keep angling yourself toward the best mountain views. See who can spot the first (actual) constellation. Leave a "reserved" sign on the seat you want, so it doesn't get commandeered while you clean up the last of the dinner dishes. Beamed ceiling and huge stone fireplace make it a great place to finally make some headway on that book you brought along. You won't have to go far to enjoy the slopes. The gondola at Steamboat Ski Resort is just 3 minutes away by shuttle. The modern amenities and beautiful surroundings make for a relaxing weekend getaway. Visit A Calming Touch Spa for a relaxing facial or hot stone massage. They even offer massage treatments for children. Recover from your day with a soak in the hot tub – take your pick, the resort has 3. Gather your crew & go – it's an 11 minute drive to the trail at Emerald Mountain and a 9 minute drive to Spring Creek Trail. Book a tee time at Rollingstone Ranch Golf Course, an easy 4 minute drive away. When you pull up to the Eagle Ridge Lodge, you’ll leave the cold and enter a warm, inviting lobby. Crackling fireplaces and Western-inspired décor give off a traditional Colorado-rustic vibe, though be assured Eagle Ridge has the amenities of a 21st century ski resort. On leisurely mornings prepare a DIY breakfast buffet in your suite’s fully equipped kitchen (stay in PJ’s as late as you like). Or, if everyone’s raring to be in line for the lifts the minute they open, grab some complimentary coffee (and cocoa!) and doughnuts from the lobby on your way out. 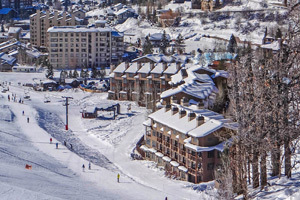 The Steamboat Ski Resort base is just a ten minute walk away, but why bother schlepping your gear through the snow when there’s a complimentary shuttle every ten minutes that takes you right to Gondola Square? Once there, drop off the crew’s newbies at the world-renowned ski school, which has everything from Kiddie Corral lessons for kiddos as young as 2 (hey, they’ll be zipping down double-blacks by age 5! ), to adult first-time groups. Grab lunch between runs at the Four Points Grill atop Storm Peak, or at the Bear River Bar and Grill at the base – they all have rad views of the slopes. Once everyone’s thoroughly snowed out, catch the shuttle back to Eagle Ridge. No need to track sludge and snow into your finely furnished suite – just drop your gear at the complimentary ski lockers right by the lobby. In the suite, light up the fireplace and gather round with some après ski cocoa. Take advantage of the fully equipped kitchen to wow your crew with your specialty hearty home-cooked enchiladas. Finish off the day with a luxurious soak in one of the three outdoor hot tubs. If you’re feeling a bit worn out from a long day of skiing, ask the concierge to book you a massage for the next morning. The onsite spa offers an array of deep tissue massages and other lavish treatments. Tell the crew you’ll catch up with them on the mountain – you deserve a morning of indulgence. The two- to five-bedroom residences are all bright and spacious, with a slight western flair. Open layouts and wooden accents complement each other to make inviting living areas, perfect for hanging as a group. In-unit washer/dryer and a well appointed kitchen add the convenience of home to your upscale vacation rental. Ask about a mountain view, and you’ll be admiring the six rocky peaks of Steamboat Mountain range from your private patio. Gondola Square is your closest bet for browsing shops or dining out, but you could also take the Eagle Ridge shuttle into charming, historic downtown Steamboat - make a day of it even. Your crew will love the waterslides at Old Town Hot Springs, or the bumper-cars-on-ice at the Howelsen Ice Arena. Not to mention the food. From creative small plates at Laundry Restaurant to classic charred burgers at Back Door Grill, there’s cuisine to suit even the pickiest eater in your group. - Front desk is open 8:00 AM-5:00 PM daily. Guests that are planning to arrive after hours must contact the property using information on the booking confirmation to receive a code to a lockbox located outside the front desk.